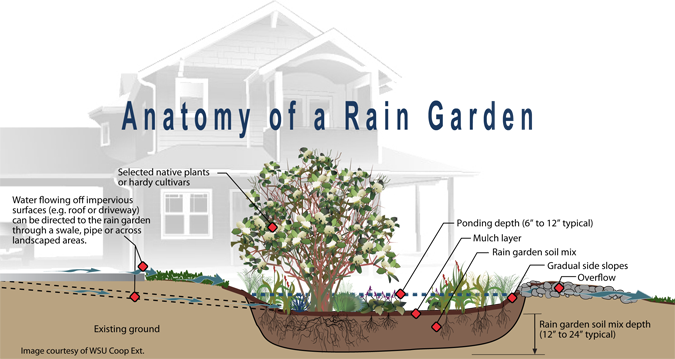 A rain garden is a garden which takes advantage of rainfall and/or storm water runoff in its design and plant selection. Rain gardens are designed to withstand the extremes of moisture and concentrations of nutrients, particularly Nitrogen and Phosphorus, that are found in storm water runoff. We also design rain gardens to accept water from a roof or rain water collection tank that can be focused to use excess water, store water in the soil and grow a range of trees shrubs and perennials. We can design and install a rain garden for you to make best use of your on-site water resources. Rain gardens work very well connected to the over-flow of a water tank since the water is already focused to the tank.